Heigh ho! Heigh ho! It’s off to Kids Kustom Parties in Palatine, IL we go. We’ll transport your little princess to an enchanted forest. 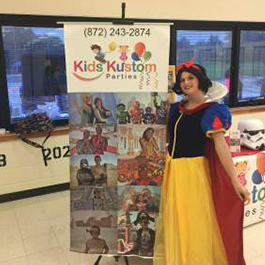 We offer three Snow White birthday party packages to fit your child’s imagination and your budget. 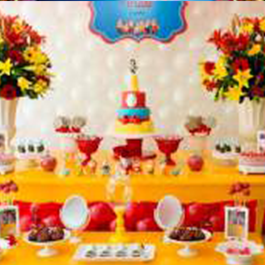 Experience a spectacular Snow White birthday party complete with Snow White and an Evil Queen. Our talented fully costumed character actors sing and dance. They’re theater-trained performers who will entertain your child and her guests. Plus, your child will get to wear a Snow White costume. ALL the birthday party guests will get to wear princess costumes, too! We provide capes and masks for the boys, who also enjoy a Snow White birthday party. If you prefer to have a home party, Snow White can come to you. Learn more about kids party characters at your venue. Snow White is a nineteenth-century German fairy tale. 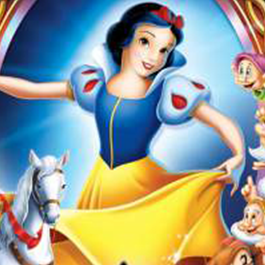 Little Snow-White was published by The Brothers Grimm in 1812. It appeared in their first collection Grimm’s Fairy Tales.